← Oxenhope & Keighley Buffets – Can YOU Help! At 7.20 on Thursday evening,3rd April, a three man team of thieves wearing high visibility jackets stole 6 metal and wood benches (similar to the one illustrated at Oxenhope), worth about £500 each, from Ingrow station yard and platform. 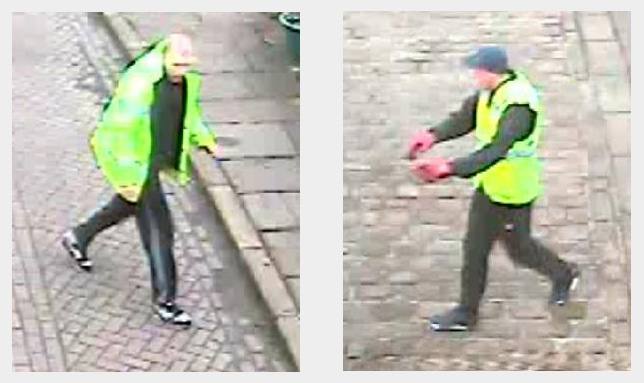 CCTV footage shows the men arriving in a white Mercedes Sprinter van, missing its front numberplate, and wearing high visibility jackets, suggesting that they were there on legitimate business. As such they probably did not arise suspicion from passers-by. The Railway has suffered from criminal activities in the past, but have never had so many benches stolen before. The only two seats left at the station now are those that are bolted to the stone wall. Whilst the theft and their monetary value is a serious matter, some benches stolen also represent a sentimental value in memoriam to members of the Railway who have sadly passed way. Money can purchase new benches but cannot replace the sentiments that the benches represented. The matter has been referred to West Yorkshire Police who have issued these photographs taken from the CCTV cameras. Do you recognise either of these two individuals. If you do or would like further information click here to visit the West Yorkshire Police web site or call Crimestoppers on 0800 555111.